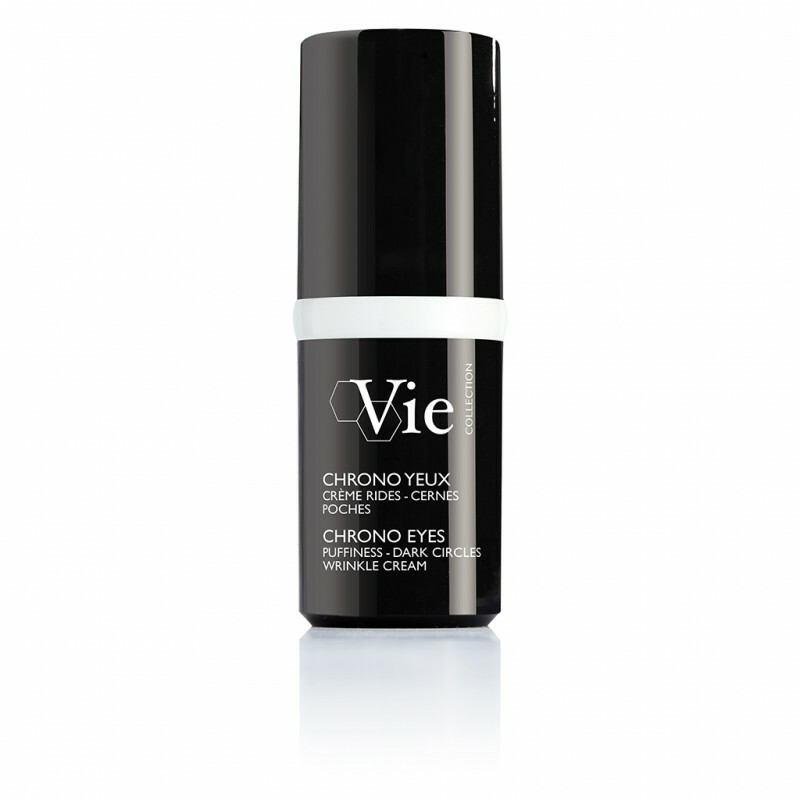 CHRONO EYES combines the performance of three cosmeceuticals ingredients to act visibly on wrinkles, dark circles and puffiness. In 1 minute*, eyes look smoothed. In 1 week*, signs of fatigue are faded. 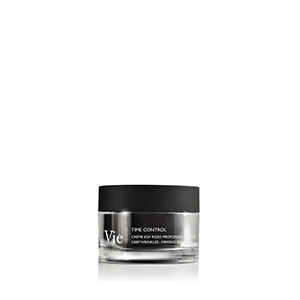 In 1 month**, the appearance of wrinkles, dark circles and puffiness is reduced. *Satisfaction test on 24 women. **Scientific tests on 22 women. The biomimetic Botox-like peptide draws its inspiration from botox injections to minimize muscle contraction and relax expression lines. Results: Expression lines are relaxed. Results: The amount of puffiness is reduced. Results: Dark circles fade and their appearance is reduced. *Satisfaction test, twice daily application on 24 women for 29 days. *Measurement of the anti-wrinkle and smoothing effect by analysis of skin replicas and ex vivo measurements of the parameters of the skin relief and microrelief with the Skin Image Analyzer® (SIA®) and QuantiRides® software. Average value. Illustration of one of the best results. *Clinical scoring. Macro photos of the crow's feet using VISIA®. A delicate and comfortable cream, enriched with moisturizing and nourishing ingredients. It has an ultra-soft, slightly pearlescent finish and gives an immediate sparkle to the eyes. Fragrance-free and tested under ophthalmological supervision, CHRONO EYES is suitable for sensitive eyes and contact lens wearers. AQUA (WATER) / EAU, DIPROPYLENE GLYCOL, GLYCERIN, DICAPRYLYL CARBONATE, BUTYLENE GLYCOL, BEHENETH-25, ZEA MAYS (CORN) OIL, BUTYROSPERMUM PARKII (SHEA) BUTTER EXTRACT, CETEARYL ALCOHOL, COCO-CAPRYLATE/CAPRATE, MYRISTYL ALCOHOL, CAPRYLIC/CAPRIC TRIGLYCERIDE, DIMETHICONE, NIACINAMIDE, PRUNUS ARMENIACA (APRICOT) KERNEL OIL, SODIUM POLYACRYLATE, PHENOXYETHANOL, SODIUM POTASSIUM ALUMINUM SILICATE, GLYCINE SOJA (SOYBEAN) OIL, POLYGLYCERYL-3 DIISOSTEARATE, HELIANTHUS ANNUUS (SUNFLOWER) SEED OIL, SUCROSE PALMITATE, XANTHAN GUM, SILICA, DISODIUM EDTA, MAGNESIUM ASCORBYL PHOSPHATE, SODIUM HYDROXIDE, GLYCERYL LINOLEATE, LAMINARIA DIGITATA EXTRACT, POLYGONUM FAGOPYRUM ( BUCKWHEAT) SEED EXTRACT, TOCOPHERYL ACETATE, TOCOPHEROL, CHLORHEXIDINE DIGLUCONATE, MICA, CRITHMUM MARITIMUM EXTRACT, PALMARIA PALMATA EXTRACT, SACCHARIDE ISOMERATE, CITRIC ACID, POTASSIUM SORBATE, SODIUM HYALURONATE, PALMITOYL HEXAPEPTIDE-19, CI 77891 (TITANIUM DIOXIDE).